Aquis Blue Marine Resort & Spa is located 6km from Aghios Nikolaos in the prefecture of Lassithi nearby the blue clear waters of Ammoudara beach. It is situated in a beautiful and tranquil waterfront setting overlooking the Mirabello bay. 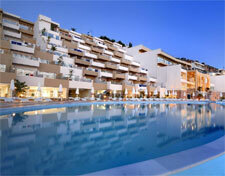 It consists of 202 airy and mostly sea sea-facing rooms, with three swimming pools. The hotel Spa offers an enticing selection of massages, facial and body treatments. Rest, relax, be pampered and exercise in our Health centre. It offers an indoor pool especially designed for a diversity of therapies, cabins for massages, sauna, Jacuzzi, Turkish bath, special rooms for face and nail treatments, gym as well as a lots of mud therapies. All rooms are well appointed in a modern manner featuring: individually controlled air conditioning unit, direct dial telephone, satellite TV, internet access, fridge, and safe deposit box. Each one has its own bathroom, hairdryer and either balcony or terrace to enjoy magnificent sea views.